In my previous post, I talked about the balance and opportunity between instructional learning and inquiry (or project based learning). My last project with Lucy Gresser in Project Based Learning at my school. I was a real attempt at combining the two methods of learning. 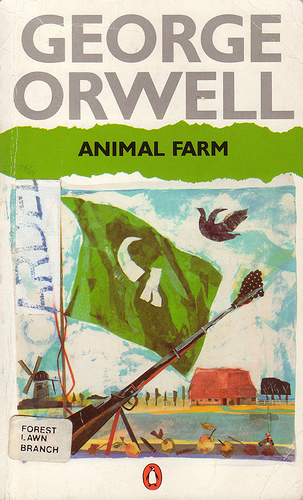 If you’ve not read the other posts on Animal Farm, then here’s the gist of part one of the project. The students were charged with reading the novel in a week, in preparation for a second week of learning about creative writing. At the end of the second week, they work collaboratively to write a 7000-8000 word novel in groups of 6 in a day using Google Docs and Blurb’s Booksmart application. These 9th grade students did not know what the second week project woud be about, whilst reading Animal Farm – but they knew it was connected somehow. Lucy is an amazing teacher, and I’d put my kids in her charge without hesitation. She demonstrates what I think are the critical characteristics of a 21C teacher – and engages and enthuses students and uses technology fluidly to connect with students. Part of the task, for students to select an online group – in which they would talk to a character in the book – who asks them questions – Each day, the character asks a few questions on each chapter as the student progresses – using Google Docs. The ‘teacher’ is blind to know who the teacher is online – though they do know their classroom teacher – so in effect many students online teacher was not their face to face one. We wanted to create a feeling of a third space, in which students would undertake conversational learning. They would debate the classroom discussion online, and answer questions that we not set ahead of time. Whatever topics the students raised, the teacher expanded upon – we didn’t want the teacher to be the ‘expert’ in the conversation – so took the approach of using the various characters of the book as the students online conversational tutor. This is a link to a PDF file of the Google Doc ‘learning’ conversation that took place over the week. The teacher comments are in green, the student’s are in black. I would really like comments on what you see going on here – in contrast to ‘instructional’ learning only. Feedback on the approach and what you see in the document is much appreciated. How has the student reacted to online conversations, is it effective learning, do you see him grow in his understanding of the text and wider issues? How? Thanks for sharing Dean. I was working some English teachers at school this past week and discussing similar things. Your post is timely and a great example to those looking for guidance. I have passed on your post to my colleagues. Cheers!